For round two I was on the low numbers at Perry St, we met at Millfield Café for breakfast and once again it was really good and I can’t fault it. 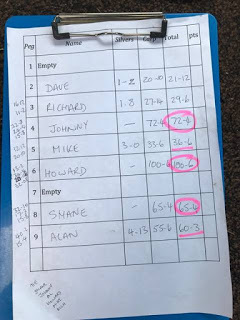 Once everybody was sufficiently fuelled up we headed to Perry St to do the draw, the Sadborow section drew and headed off first and then it was our turn, I fancied pegs 4, 6 or 10 but pulled out peg 2. The Tart had drawn peg 6 and with Picky on the end peg (1), I checked my pockets to make sure I had enough pounds to pay out the side bets. 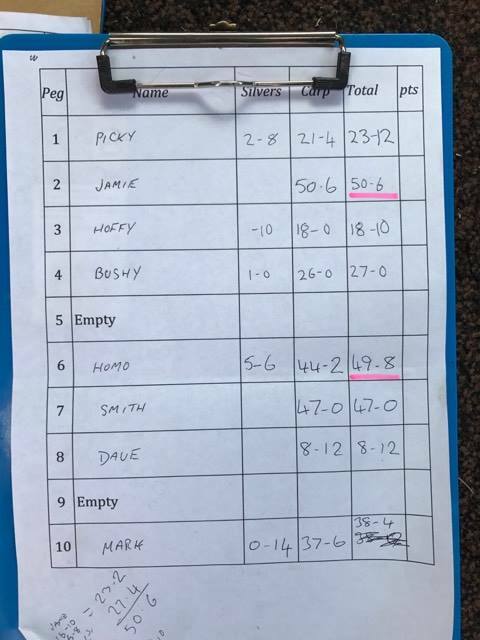 The Hoff was on peg 3 on my left with Bushy on peg 4, Squadron Leader Smith was in 7, Dave Abrams in 8 and Mark on the other end peg (10). The peg looked nice although I couldn’t see any carp cruising about, I set up my favourite little in-line dibber for fishing shallow, a 0.4 gram Drennan Carp for the five metre meat line and a little rig to fish by the fish refuge on the inside on my right. The side tray had the usual 6mm meat to which I added some Bait-Tech Liquid Plum, 6mm Carp and Coarse Pellets, red maggots and I also had a pot of 8mm Juice Dumbells for a change of hook bait. On the whistle I cupped in some meat at five metres and then meat, pellets and maggots on the inside before starting out at 11.5 metres with a banded pellet. 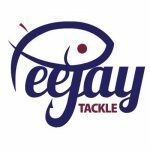 I could only see a few anglers around me because of the tree to my left but already it sounded like the Tart and Mark in peg 10 were bagging. It took 15 minutes to get my first bite and I landed a small carp around 2-3lb, I had another three including a couple of better ones to finish a good first hour. Picky hadn’t caught yet and both him and the gorgeous Mr Chant in peg 20 were having problems with some surface scum that was collecting in their pegs. 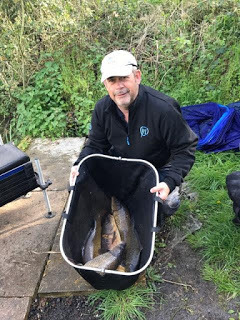 Geoff on 19 and Chilly on 17 hadn’t caught yet either but they were in the other section, the only anglers I could see in my section were Picky and Hoff so would have to rely on the bankside banter to see how the rest were doing. I could see quite a few groups of carp swimming about now and had managed to successfully stalk/mug the odd fish and I had two quite quickly at the start of the second hour and started to think a big weight was on the cards. I hooked carp number seven but it came off and then the fish just switched off. By the end of the second hour I was still stuck on six fish, by all accounts, the Tart was still catching well and whipping the water to a froth with his slapping! I decided to stick at fishing shallow for another hour as the people I could see were fishing on the deck and in the margins and nobody was catching. 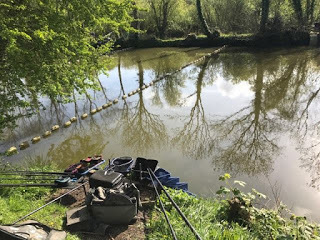 I was still feeding a few pieces of meat at five metres and maggots and pellets down the edge and would try these lines next if no more shallow fish were forthcoming. I didn’t add any more fish to my nets over the next hour so tried the five metre line for the first time but the float never moved, next I went next to the floating platform with a cube of meat on the hook, I had a couple of knocks and the float did sail away but I missed it and it may have been a liner. 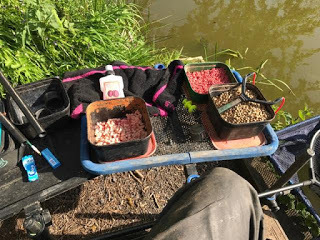 I was still pinging pellets out to 11.5 metres and as some fish were mooching about I went back out and over the next hour or so I added a couple more fish. I also hooked a fish that tore all over the place before snapping the hooklength and I fear it may have been foulhooked. Chanter had started catching some small rudd and Picky had got off the mark with a couple of carp, Hoff had landed a couple but also suffered a pole breakage on an angry fish and Chilly had a couple of carp from his inside line. I decided to try one of the new Bait-Tech 8mm Juice Dumbells and picked a white one as it would be a nice visual bait. I spotted a pod of carp and flicked the rig out so it landed in their path, the float buried and after a long scrap, I netted a fish that looked to be 8-9lb. A few more fish started showing, Picky had a nice tench, both him and Chanter also had a couple of fish shallow and even Chilly tried it! I got to twelve fish with about an hour to go and tried the inside line again but still no bites. 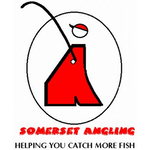 I heard Les say that every time he looked up, Mark was playing a fish in peg 10 and with the Tart catching as well, I thought I was fishing for third in the section at best although apparently Major Smith had bagged up as well. I pulled out of a fish and then next chuck landed number thirteen and that was the last of the action. I wasn’t sure what weight I had but thought probably around 40lb. I packed up and took my kit back to the car before waiting for the scales to arrive at peg 1, Captain Smith said he’d finished up with twelve carp and the Tart was admitting to 40lb so this could be closer than I originally thought, then Mark said he’d only had ten carp which surprised me but it just goes to show you shouldn’t always take the bankside telephone as gospel! The scales arrived and Picky had finished up with five carp and a tench for 23lb 12oz, then my three nets went 50lb 6oz which was a little bit more that I thought. I managed to get photos of Picky and me but then somehow ended up with the weigh board and the scales party took off at pace and trying to add up peoples totals, I didn’t manage to get any more photos! 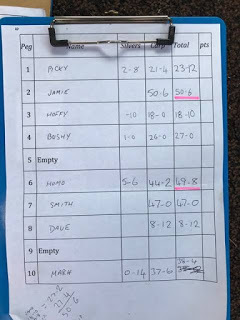 Hoff had 18lb 10oz, Bushy had 27lb and then we got to the Tart, he had 5lb something of silvers and then after we totted up his two carp nets, his total came to 49lb 8oz, so it was very close but no cigar!. Brigadier Smith was next door and his first net went just over 30lb but he had smaller fish in his second net and his total was 47lb. 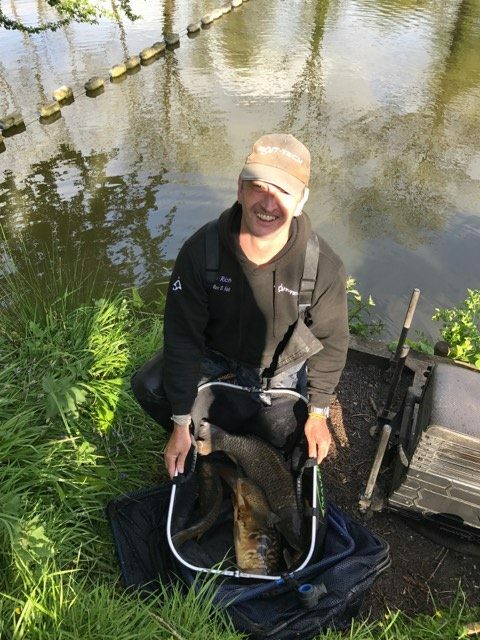 Dave Abrams on peg 8 had 8lb 12oz and then the last peg in the section was Mark on peg 10 and he had 38lb 4oz. So it had been tight with just one fish separating the top three. 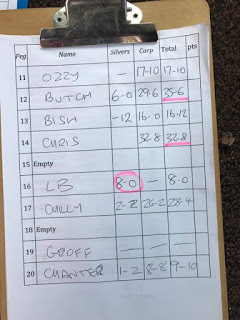 In the other section Oz had 17lb 10oz from peg 11, Butch did well in 12 to win the section with 35lb 6oz, Bish on 13 had 16lb 12oz and Chris had 32lb 8oz for second in the section from peg 14. Les had 8lb of silvers from peg 16 and then Chilly had 28lb 4oz. 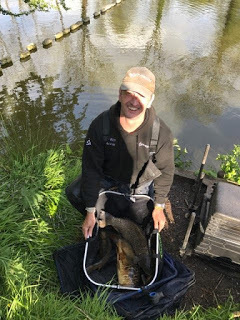 Geoff had really struggled in peg 19 but had avoided the blank with a small eel and Chanter weighed 9lb 10oz from peg 20. 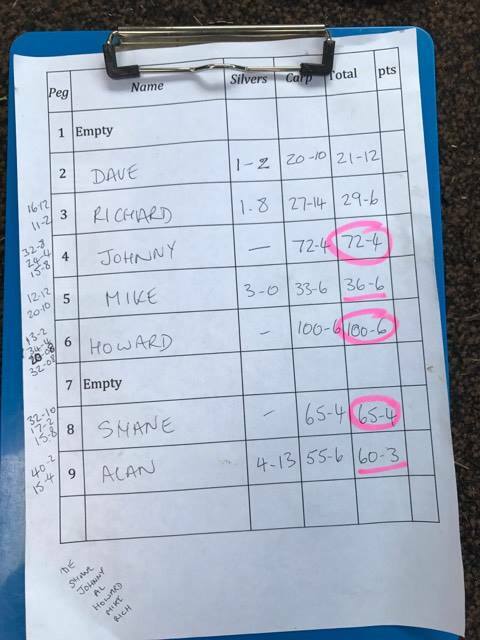 Back at the results and once again Sadborow provided the top weights with Howard winning from peg 6 with 100lb 6oz, Janders was second with 72lb 4oz from peg 4 (but still had to pay me a pound as we did it on section points if we were on different ponds) and Shane was third with 65lb 4oz from peg 8. Dunner had the section money be triple default with 60lb 3oz and Mike Collins picked up second in the section with 36lb 6oz from peg 5. So a really nice day and I picked £55 for the section plus nuggets off the Tart, Picky and Janders. It’s early days in the league but after two matches, Howard is leading with 3 points followed by Shane on 4 and then several people on 6 and 7. I think I’m at Sadborow for the round three but it’s not for a few weeks so I’ll be at Summerhayes next week.